From the beginning of Prabhupada’s preaching in New York, he spoke about the development of an international society. But his band of new followers couldn’t imagine Krsna consciousness going beyond the walls of the little storefront on 26 Second Avenue. Fortunately Prabhupada had deep faith in Lord Caitanya’s prediction and the instructions of his Guru Maharaja. In fact, he had so much faith that he said Krsna consciousness would someday go down in history for changing the world in its darkest hour. 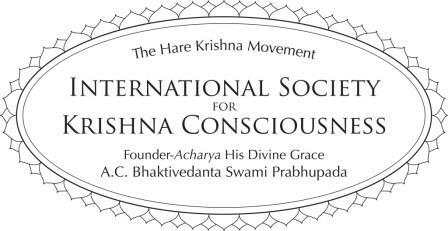 There are reason’s that Prabhupada thought this way, and in this newsletter I examine one of the most essential; taking personally responsibility for making the world Krsna conscious. Instead of thinking people are not interested in Krsna consciousness, Prabhupda always taught us to see that it is our fault that we cannot interest them. This empowered way of thinking is at the heart of Prabhupada’s own success – and at the heart of our potential success. The preaching of the Gaudiya Math (the movement that Srila Bhaktisiddhanta Sarasvati founded) during Srila Bhaktisidhhanta’s life was so powerful that the most famous and prominent religious movement in Bengal at that time gradually lost its popularity. The Gaudiya Math publicly exposed the leader of this movement (he claimed to be an incarnation of Rama and Krsna) and proved that his teachings deviated from the conclusions of the Vedas. However, shortly after the demise of Srila Bhaktisiddhanta, that very same religious movement began gaining popularity and again became an influential force in India, misleading millions of people. Prabhupada said their success was the fault of the Gaudiya Matha because after the departure of Srila Bhaktisiddhanta the Gaudiya Matha fragmented and the consequently the preaching diminished. About five years ago when I was living in Dallas, several people were shot to death at a weeknight church service. In responding to this incident the pastor of the church said to his congregation, “We are all responsible for the death of those church members.” He said the fact that there are people roaming the street who are so spiritually bankrupt that they would kill innocent people in a church service is a sign that our efforts to spread Christianity are failing. I was impressed by his words. Basically he was saying the same thing that Prabhupada said about the Gaudiya Matha. When a devotee of the Lord sees godlessness in the world he doesn’t blame it on the people. Rather he blames it on the lack of spiritual guidance that is being given to the people. And what this really means is that you and I take responsibility for the lack of God consciousness in the world. Nothing is set in stone. Spreading Krsna consciousness depends on you and me. In 1973 I was living in the San Diego temple and the preaching was rapidly expanding. We regularly reported our successes to Srila Prabhupada. He appreciated our service and in one letter to us made an amazing prediction. “If we go on preaching vigorously as we have been for another 25 years, then all these other so called religions will disappear. After all what do they have to offer?” (letter to Bhakta dasa, 1973). That letter has always weighed heavy in my mind. These other religions have far from disappeared. What Does Our Desire Have To Do With It? You have more influence over people’s spiritual lives than you might think. 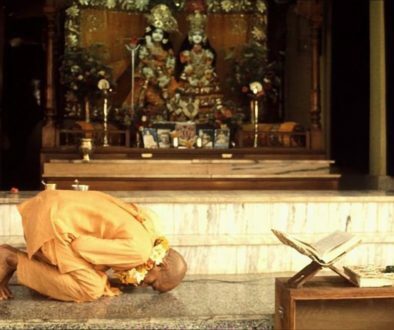 As it is said, “Pray as if everything depends on God and act as if everything depends on you.” This is what Prabhupada did and Krsna definitely answered Prabhupada’s prayers. Personal responsibility towards preaching is empowering. Prabhupada’s god-brothers went to preach in England in the 1920’s and came back saying that the westerners are too fallen to take up Krsna consciousness. Fortunately, Prabhupada didn’t think this way. He took personal responsibility to spread Lord Caitanya’s mission. Remember, ninety-nine percent of all failures come from people who have a habit of making excuses. If the world is not Krsna conscious, we need to look at ourselves. Whenever devotees made excuses and told Prabhupada things like people in certain countries are not receptive or difficult to preach to, Prabhupada always said that the problem was not with the people they were preaching to; the problem was with us. 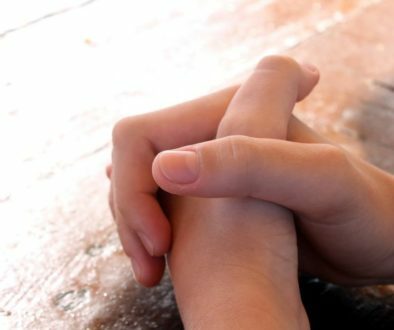 What if I Am Not a Merciful Person? Once Bhumi, mother earth, was not producing enough food to feed the entire population of the world. When King Prithu asked her why she hadn’t produced enough food she told him she didn’t want to feed all the demoniac people that lived on earth. Maharaja Prithu chastised her and was ready to kill her. To protect herself she took the form of a cow thinking the king wouldn’t hurt a cow. But he continued to pursue her and said that if a citizen is not compassionate on his fellow man, he or she may be killed by the king and such killing is never to be considered actual killing. So the implications of not caring about others are heavy. But it is even heavier for us. Why? It is said that with the gift of knowledge comes the obligation to give it to others. We have been given so much knowledge that we are duty bound to see that it is distributed. In fact, many times Prabhupada said that it was the duty of every Indian to distribute this knowledge. “Although India has the sublime knowledge of Bhagavad-gita, Indians have not done their proper duty of distributing it.” (Srimad Bhagavatam, 10.2.19). How many Indians realize that it is their “PROPER DUTY” to spread Vedic wisdom? And this is not just the duty of every Indian, it is the duty of everyone who has received Vedic knowledge. From practically the very beginning of the movement Prabhupada made this clear. 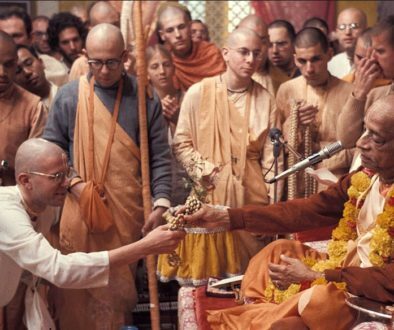 At an initiation in 1966 Prabhupada said that he is giving knowledge and the initiates are becoming obliged, by accepting initiation, to distribute it widely. He said this is their guru-daksina. Before I go on, I want to make it clear that I am not talking about preaching in any specific way. We can help others become Krsna conscious in unlimited ways. We all have some special gift to offer in Krsna’s service. Krsna consciousness means to connect with our inspiration and talents and use them in Krsna’s service to help the world. To clarify my point and perhaps excite your imagination, I’d like to share with you one inspiring example of how this might be done. This is the mission of one successful author and speaker (who, by the way, became successful as a result of this mission statement). There are as many ways to serve Krsna as there are devotees. I’d like to share a quote that will hopefully get you thinking how you might be able to expand your service in some way. What more could you be doing if you asked this question – and asked it often? If you do regular service at the temple I am not in anyway minimizing that. I am just asking you to consider what more you can be doing by asking yourself how all the fallen souls can be saved. If we, as a society are to help the world, I believe it is essential that everyone of us ask ourselves this question continually. Do We Really Care About Others? Let me share a thought that has always inspired me. I know that right now there are people somewhere whose lives I can touch by making a little personal sacrifice, by going out of my way to do something to further the mission of Krsna consciousness. I may not know who those people are and I might never meet them; and I can’t always say how my efforts to spread Krsna consciousness will directly influence them. But I do know that doing nothing isn’t helping anyone. There are people all over the world who want Krsna conscious. The reality is that the choices you and I make in our daily lives determine whether some of them will get it or not. If we care about others we will take care of our own spiritual lives. Lord Caitanya said make your life successful and then make other’s lives successful. Physician, heal thyself. Devotees have often overextended themselves in the name of preaching and either eventually burned out or fell down as a result. Dead men don’t make good soldiers. The exercise was actually given above, but I will restate it again. And never stop asking this question.